He was assigned to Marine Corps Base Hawaii. 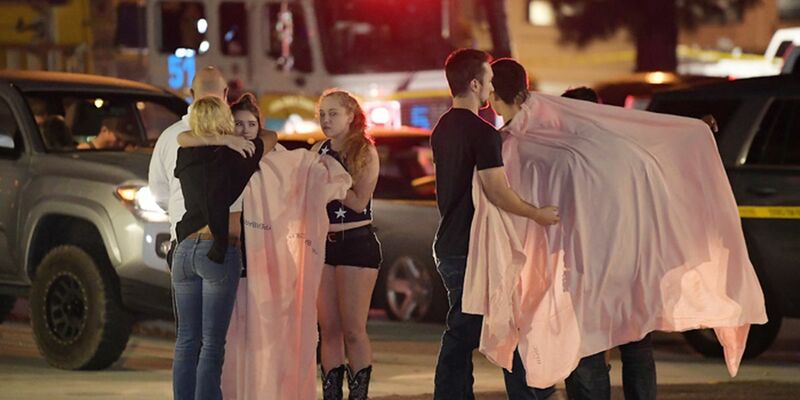 People comfort each other as they stand near the scene Thursday, Nov. 8, 2018, in Thousand Oaks, Calif. where a gunman opened fire Wednesday inside a country dance bar crowded with hundreds of people on "college night," wounding 11 people including a deputy who rushed to the scene. Ventura County sheriff's spokesman says gunman is dead inside the bar. HONOLULU (HawaiiNewsNow) - The suspected gunman in the deadly California mass shooting on Wednesday was a former U.S. Marine who was last stationed in Hawaii, military officials said. Officials said 28-year-old Ian Long spent over four years in the Marine Corps and was deployed to Afghanistan from November 2010 to June 2011. His last duty station was with the 2nd Battalion, 3rd Marine Regiment, Third Marine Division Marine Corps Base Hawaii in Kaneohe Bay. He left the service in 2013. Long is accused of opening fire at a country club music bar in Thousand Oaks, Calif. late Wednesday, killing at least 12 people. Authorities say he used a smoke bomb and a handgun to carry out his massacre. He was dead at the scene from what’s believed to be a self-inflicted wound. Police say they had multiple run-ins with Long in the past One of them involved an apparent disturbance at his home in April that prompted mental health specialists to talk to him. But they determined then that Long was not an immediate danger. Wednesday night’s shooting comes less than two weeks after 11 people were killed at a Pittsburgh synagogue.